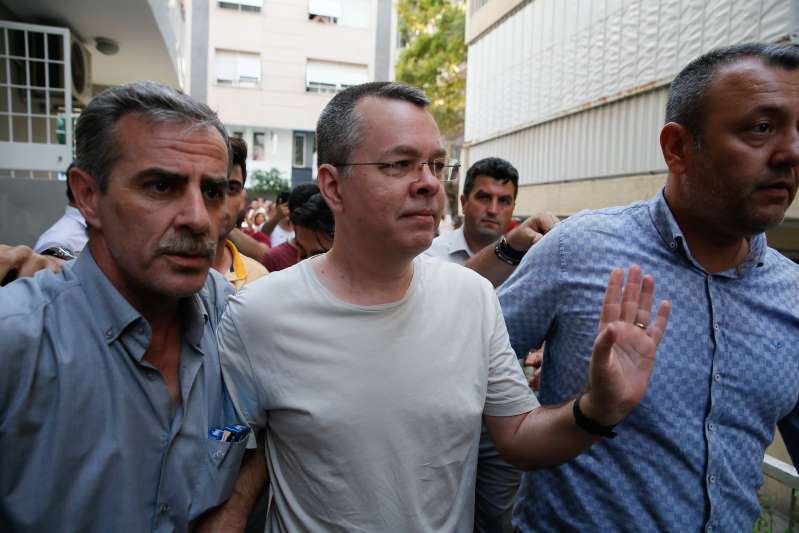 American pastor Andrew Brunson, center, was moved from jail to house arrest in Izmir, Turkey, on July 25, 2018. U.S. President Donald Trump said he’ll impose “large sanctions” on Turkey over the detention of an American pastor, plunging relations between the two NATO allies to a new low and extending a rout on Turkish financial markets. Turkey’s Foreign Minister Mevlut Cavusoglu responded on Twitter, saying that no one can dictate to his country. “We will never tolerate threats from anyone,” he said. [post_ads]The episode is the latest in a series of crises between the longtime allies. The U.S. has slammed Turkey’s plans to buy a missile defense system from Russia, an issue that’s already raised the threat of American sanctions. The countries have also clashed over the war in Syria, where Turkey has increasingly acted in concert with Russia and Iran. President Recep Tayyip Erdogan blames the U.S. for backing Kurdish militants in Syria, and harboring the alleged mastermind behind the coup attempt against his government. The Turkish lira extended losses, leading declines among global currencies. It slumped 1.8 percent to 4.86 per dollar, close to a record low, at 8 p.m. in Istanbul. Neither Trump nor the White House offered any immediate details about the measures that the U.S. may take, or how soon they may be imposed. Earlier Thursday, Vice President Mike Pence also blasted Turkey over the pastor’s detention. Erdogan’s government arrested Brunson in 2016 and indicted him last year on charges of espionage and attempting to overthrow the state. On Wednesday, after a year-and-a-half in jail, he was released to house arrest. But that move didn’t assuage U.S. anger. The escalation of the dispute by Trump and Pence on Thursday reflects frustration over the breakdown of a diplomatic deal that was supposed to have seen Brunson freed and deported back home, according to a person familiar with negotiations. The agreement broke down when Turkey increased its demands for a quid pro quo, calling for the abandonment of U.S. legal action against a Turkish bank blamed for helping evade Iran sanctions, the person said. State-owned Turkiye Halk Bankasi AS is under criminal investigation in New York’s southern district on the Iran charges. A senior executive at the lender was jailed by a U.S. court in May. Halkbank is seen as a likely target of penalties as a result of the investigation. Some analysts have raised the prospect that Trump or the U.S. Congress will impose broader measures that could target business leaders close to Erdogan’s government, along the lines of American sanctions against Russia. Pence, who said he spoke to Brunson on Wednesday, described the pastor’s move to house arrest as "a welcome first step" but "not good enough." The pastor’s detention has come at a critical time in U.S.-Turkey relations. Erdogan has been infuriated by U.S. support for Kurdish rebels in Syria, who he views as linked to domestic terror groups. And his decision to purchase the Russian S-400 missile system has raised questions about Turkey’s role in the North Atlantic Treaty Organization. The S-400 deal and other tensions have prompted U.S. lawmakers to call for a halt in sales of F-35 military jets to Turkey, even though several key parts of the fighter are made in Turkey. Defense Secretary Jim Mattis has opposed that effort. Turkey is demanding the U.S. extradite Fethullah Gulen, a cleric and former Erdogan ally living in Pennsylvania, who the Turkish president blames for engineering the 2016 coup attempt. Trump and Erdogan, who last month won re-election in a vote that granted him broad new powers, were seen speaking at length during a gathering of NATO leaders in Brussels earlier this month.